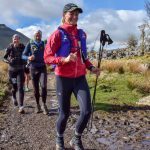 Louise Arnison recently completed the gruelling Fellsman, 61 miles over hard, ragged, boggy, pathless terrain. Louise is a real tough cookie who loves adventures and challenges so it should be no surprise that she set off on this latest adventure. The Fellsman takes place in Yorkshire, encompassing all of the above adjectives – and, for a bit of fun, lots is in the dark! Louise did say never again but is already planning how she can beat her time! Hats off lady! 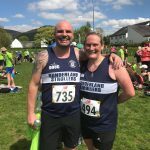 Trails were the place to be over the Bank Holiday Weekend with Strollers rocking up to Keswick half and Lakeland Trails. Doug Rutherford was first Stroller at Keswick, followed by Tara and Adam Taylor. 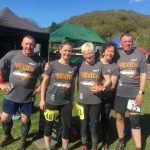 Meanwhile, keeping the Lakeland theme, Mick, Audrey, Gill and Kate completed the 17k around Hawkshead. Well done, beautiful weather for some stunning scenery.